Walking along a forest path at night in the dead of winter, you come upon a poor young mother. She is dressed in only a thin, white kimono, and desperately clutches her newborn baby to her chest. Seeing you, her face lights up with hope and she holds out her baby to you, begging for help. 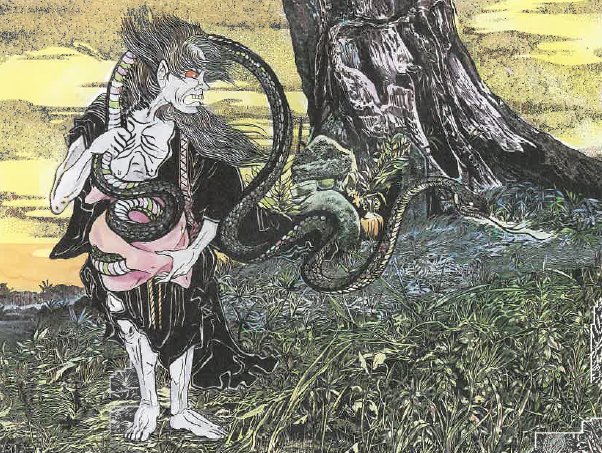 But you must harden your heart and walk away from this tragic scene—for if you take the offered baby, you will be frozen to the spot, trapped; a fresh meal for the Yuki Onba and her terrible little offspring, the Yukinko. What Do Yuki Onba and Yukinko Mean? Yuki Onba’s name is a little awkward to put into English. It uses the kanji 雪 (yuki; snow) + 乳母 (onba; nursing mother.) English doesn’t really have a specific word for mothers with newborns who are still nursing. 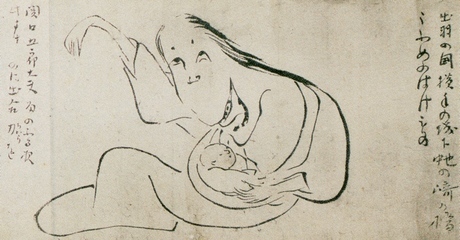 In Japanese, the word onba can also mean wet-nurse, but it this case it refers specifically to a woman with a baby still young enough to be breastfeeding. 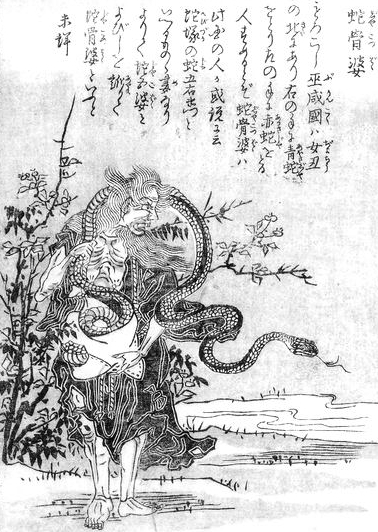 The baby in this two-person yokai combo is called a Yukinko, and uses the kanji雪 (yuki; snow) + 子 (ko; child) to make 雪ん子 – Yukinko. 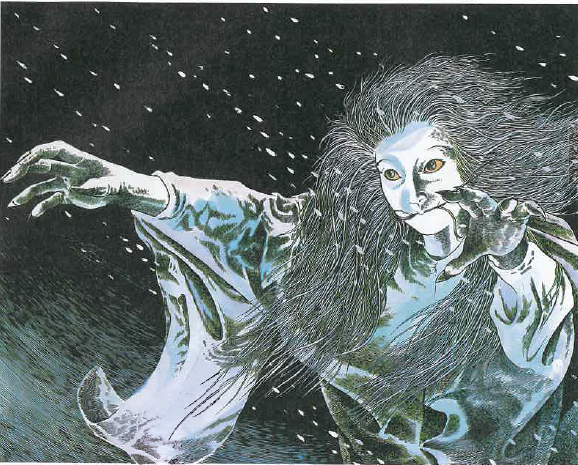 Yuki Onna or Yuki Onba? 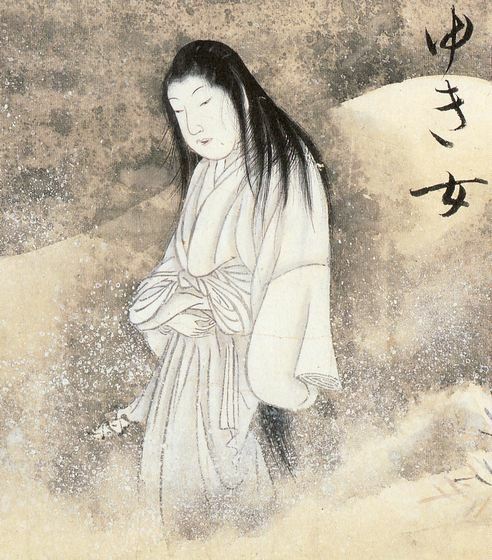 The Yuki Onna, Japan’s Snow Woman, is one of the most difficult yokai to write about. Mostly because there are innumerable different versions of her tale, and a multitude of names that she goes by. 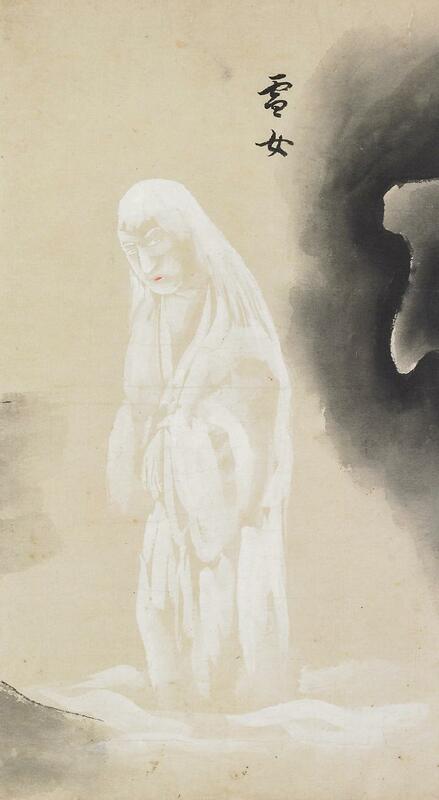 It is difficult to determine exactly what a Yuki Onna is. 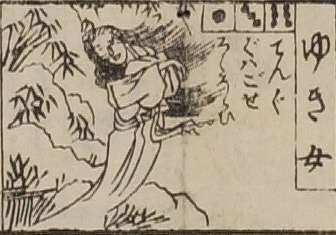 Like this one—is the Yuko Onba a separate yokai, or just the Yuki Onna by a different name? I thought the two were different enough that I decided to break the Yuki Onba stories out as a separate yokai. But just as often you will hear the same stories referring to a Yuki Onna. 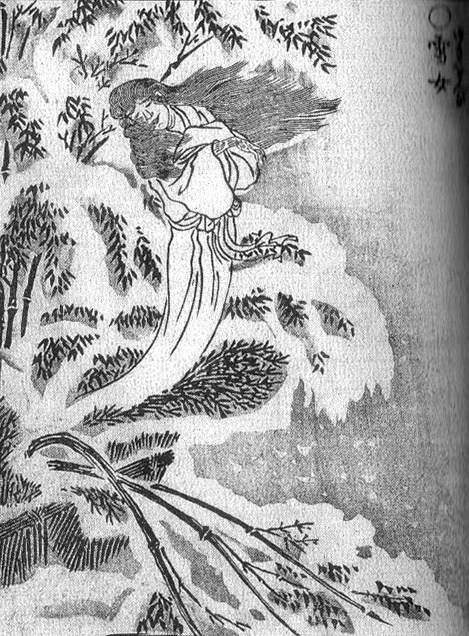 Even then, no matter what you call her—Yuki Onba or Yuki Onna—she is just a snowy version of Japan’s famous ubume legends (See Two Tales of Ubume). I don’t know what it is in Japanese folklore about a woman offering you a baby to hold, but there are few things more terrifying. In the snow or in the woods or on the beach, if a mysterious woman in Japan asks you to hold her baby, just say no. There are often grave consequences. 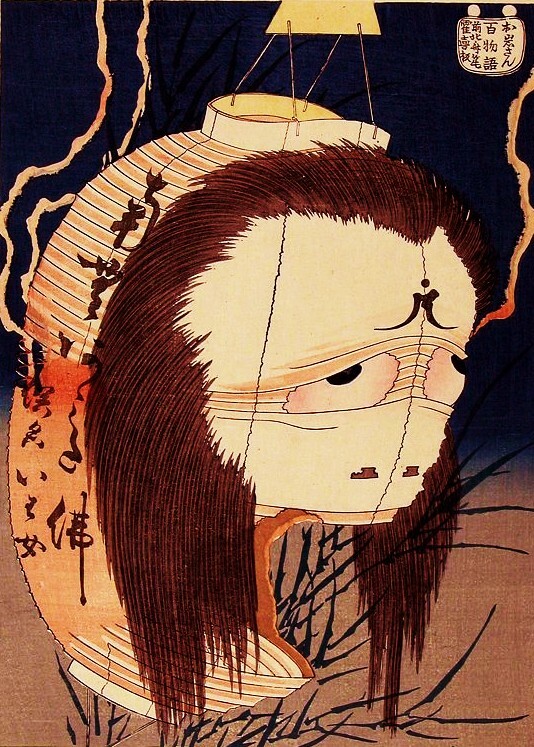 The little baby in this two-yokai combo doesn’t play much of a role—it is just a newborn baby asleep in swaddling clothes. There is some questions as to whether the Yukinko exists at all, or is just a creation by the Yuki Onba as a way to lay her trap. But as you will see from some of the stories, there is evidence that the Yuki Onba cares deeply for the Yukinko. This suggests it is a real child after all. This story comes from Hirosaki city, in Aomori prefecture. 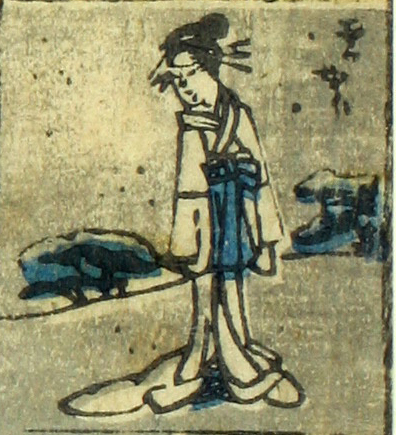 It is said on dark and snowy nights, travelers sometimes encounter a poor woman holding tight a child standing alone in the middle of a forest. The woman will approach the man and beg him to hold her child. If the man accepts, and holds the child, he is frozen to his spot. Unable to move, the Yuki Onba laughs as snow drifts build around him and freezes him to death. If the man refuses to hold the child, the consequences are equally deadly. The Yuki Onba pounds the man on the head in rage, and drives him into the snow like a hammer hitting a nail. Either way, the man becomes a feast for the Yuki Onba and her demon child. One clever warrior got the better of the Yuki Onba though. Accepting the offered child, he took his short sword and held it between his teeth. As he held the child, he pulled its head closer to his dagger. Finally, when the sword was a hair’s breadth from slicing the child, the trembling mother asked the man to return her child. The warrior returned the child to its frozen mother, who wept with joy. The Yuki Onba was so grateful she showered the warrior with gold and gifted him supernatural strength. 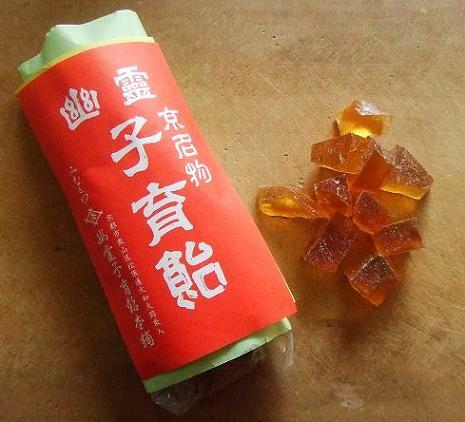 This story comes from Miyagi prefecture. A group of samurai were on duty, guarding the borders of their lord’s town. They camped in the forest, and huddled around a fire at night to keep warm. As they sat around the fire they swapped tales. One samurai said these woods were terrorized by a Yuki Onba, and that she had been seen recently. His companions laughed and chided him for believing in children’s stories. Eventually, one of the warriors excused himself and headed into the dark forest to relieve himself. As he went further into the forest, he saw the dim outline of a beautiful woman clutching a tiny baby. He approached cautiously, and saw that she was crying. The woman asked the samurai to please hold her small child and protect him from the cold. The samurai was moved to sympathy by the scene, and took the baby in his arms. To his surprise, it was colder than the snow around him, and stuck fast to his arms. He could not put it down. The child also grew immensely heavy, and the warrior fell to his knees under its weight. The last thing he saw on Earth was the woman’s tears fading and a broad smile growing across her face. The next morning, his companions found him frozen solid, clutching a giant icicle. After other encounters with the deadly Yuki Onba, the samurai were determined to rid the town of her and set off hunting her in the forest. One warrior came across a tiny child running freely in the snow. The man was shocked, as the child was so small he came up only half-way to his knees. As he chased after the child, something incredibly happened. 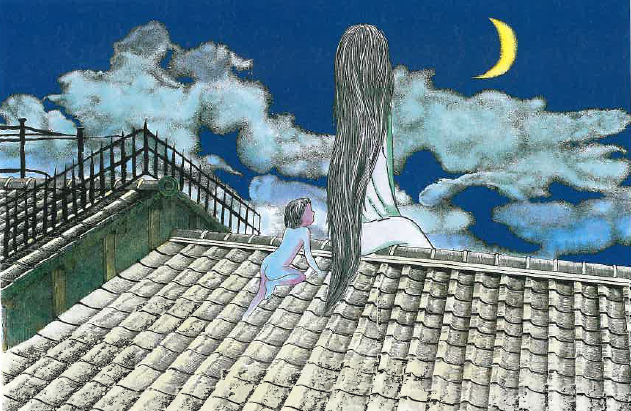 With each step, the child seemed to grow larger and larger. Soon it was past the warrior’s waist, and then his shoulders, and then as tall as the warrior himself. Suddenly, the boy turned and grinned at his pursuer. And he kept growing. Right before the warrior’s eyes, he grew to the size of a house. Steeling his nerves, the warrior drew his sword and charged at the gigantic baby, slashing with all his might. Much to his surprise, the baby shattered into a million shards with a single blow, like a hollow ice sculpture. There was nothing left. And, for whatever reason, the Yuki Onba and her child were never seen again in that forest. A new snow yokai for December! I had a difficult time figuring this one out. Originally I put the Yukinko with the Snow Babies entry, but it didn’t really fit. 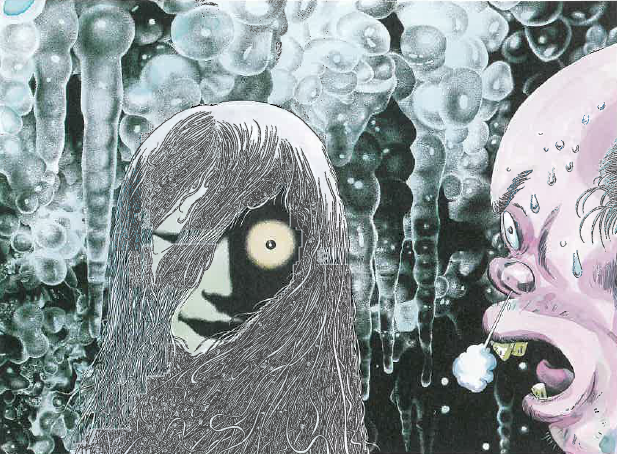 Then I had them both in the general Yuki Onna entry (Coming soon! ), but it didn’t fit there either. I finally decided the stories were unique enough to warrant their own entry. So I cheated on the pictures. 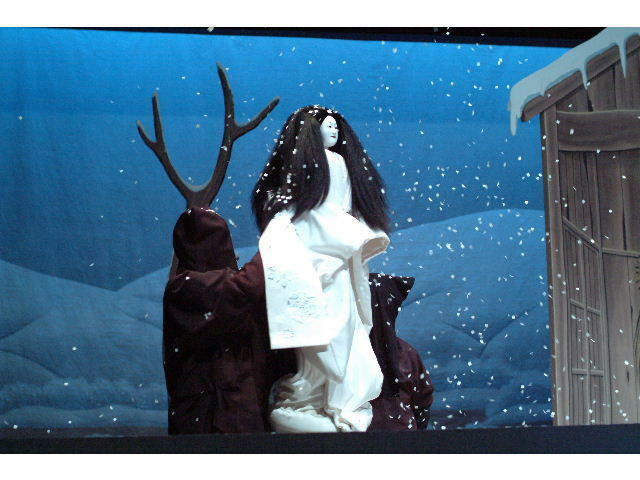 These are actually pictures of a Yuki Onna and an Ubume. You’ll have to use your imagination to put them together for a true image of a Yuki Onba and her murderous child, the Yukinko!